Transitions are challenging. They also are great opportunities for the emergence of new ideas and improvements. As it says at the top of the page, the true purpose of LeanRI.org is to provide a vehicle for collaboration and a forum to exchange ideas for the sole purpose changing Rhode Island's fundamentally broken systems. The problems that plague Rhode Island are not unique to our state. We welcome viewpoints, input and resources from around the country and around the globe. LeanRI.org is a place to share best practices and have frank discussions about the challenges we collectively face so we may surface opportunities to work together to improve. So what specific changes are in store for LeanRI.org? We will focus on providing weekly or twice-weekly posts about a current issue or resource that we believe is relevant to the discussion of how Lean Thinking can positively impact our state - both in the private and in the public sector. As a reader (whether in Rhode Island or facing challenges in your own state), you are absolutely encouraged to provide insights, feedback and links to resources that are relevant to the discussion. As the new moderator for LeanRI.org, I'm excited about the changes in store and welcome your feedback as we go forward. This is the Plan... and I'm looking forward to the Doing, the Checking and the Adjusting to create a rich forum for discussion. When you think of a hospital, what comes to mind? Patients, emergency rooms, technology and medical advancements. Making the sick and injured well again. When officials at Virginia Mason think of hospitals, they think of cars. A car manufacturing plant, to be exact. Beginning in 2000 the hospital's leaders looked at their infrastructure and saw it was designed around them, not the patient, said Dr. Gary Kaplan, Virginia Mason's chairman and chief executive officer. For example, you hurry up and be on time, only to wait for the physician to see you. VIBCO Vibrators (Headquartered in Wyoming, RI) is featured in a new training DVD from GBMP (Greater Boston Manufacturing Partnership). The DVD premiers at the Northeast Shingo Prize Conference in Worcester, MA on October 8, 2009. It will be available for purchase ($129.00 retail) from GBMP starting October 9 via their online store www.shopgbmp.org. “VIBCO Vibration Nation: Learning to See" is a high-energy, Virtual Plant Tour and lesson designed to train, educate, motivate and inspire viewers to embrace a lean philosophy and grow a lean culture. “We were looking for an organization with an exceptional depth of lean understanding and breadth of employee participation. We found it at VIBCO Vibrators. The company president understands that employees are the most valuable resource, and improvement ideas spring from every body, every day. The "Vibration Nation", as they call themselves, has unleashed the power of kaizen, which they freely share with their community. GBMP is pleased to be able to expand this sharing through the release of the VIBCO Vibrators plant tour DVD.” says GBMP President, Bruce Hamilton. This new DVD showcases the transformative impact of lean on VIBCO and how adopting lean principles can transform any organization – whether public or private, government, manufacturing, high-tech, or service-related. This shop floor and back-of-the-house virtual tour includes valuable lessons about management's key role as part of a successful lean transformation. VIBCO is committed to producing a complete product portfolio that is 100% Made in the USA. VIBCO sought and was awarded a $49,380 Comprehensive Worker Training Grant from the Governor’s Workforce Board (maximum award is $50,000) to continue and expand training and learning opportunities for all VIBCO employees. VIBCO has been named a winner of the Best Places to Work in Rhode Island by the Providence Business News and Best Companies, is a winner of the Progressive Manufacturing PM100 Award, and is a past winner of a Providence Business News Business Excellence Award. Founded in 1962, VIBCO Vibrators designs, manufacturers and markets a comprehensive range of electric, pneumatic and hydraulic vibrators for construction and industrial use. VIBCO Vibrators also designs, manufactures and markets a complete line of vibratory plate compactors and rollers. All standard VIBCO products are available from stock same or next day and the company is committed to quality, throughput and innovation. VIBCO Vibrators is headquartered in Wyoming, RI, USA. VIBCO Vibrators sponsors LeanRI.org – a collaborative effort of private citizens, business leaders, educators, government workers, and elected officials with the sole purpose of transitioning a fundamentally broken system into a highly productive engine of growth that is sustainable and continuously improving. Through education and the implementation of universally accepted best practices within a climate of continuous improvement, Rhode Island will dramatically differentiate itself and begin to retain and grow its existing workforce, attract new business, and provide more efficient services in the public and private sector. St. Joseph Medical Center has taken notice of the Toyota Way. The Towson-based hospital has adopted the automobile maker’s innovative strategy for streamlining car production and applied it to its emergency department, reducing the length of time a patient waits there by 25 percent over the last year through more efficient communication systems. Lean manufacturing techniques, pioneered by Toyota, cut waste by improving the pace of the production cycle, bringing more value to customers at a lower cost. In hospitals, lean techniques translate to cutting down patient wait times, improving patient flow and upgrading the patient experience. Two years ago, St. Joseph brought in Dave Norton, a 37-year auto industry veteran who worked for Toyota and General Motors, to lead its lean efforts. The hospital fully implemented the program in its emergency department last year after word came from management that the hospital needed to shrink the length of emergency department stays. St. Joseph cut the average emergency department visit down from 5 hours and 57 minutes to 4 hours and 30 minutes in fiscal 2009, which ended June 30, said Durenda Juergensen, assistant vice president of nursing. Now, instead of waiting to take blood until a bed opens up, patients get their blood drawn immediately. A major emergency department obstacle is knowing when a patient can move to the next step of the process, whether that’s reviewing lab results or getting discharged. St. Joseph implemented a color-coded patient tracker system that gives doctors, nurses and technicians visual cues on patient status, for example, by changing the color in each letter of the word “lab” to show when blood has been taken, dropped off for testing or the full lab results are available. The hospital achieved the reduction last November and has sustained the drop, Juergensen said. Clogged emergency departments have become a major issue nationwide, and many hospitals say the problem is a lack of beds. But St. Joseph found that streamlining the process of moving patients from the emergency department to inpatient beds freed up space in the emergency department. The hospital cut the average move to an inpatient bed to 50 minutes — down from 1 hour and 50 minutes — by creating a system that sends a page to hospital staff when a bed has been assigned, instead of requiring multiple calls between staff to see if the bed is available. “You have built capacity of your emergency department without building anything with bricks and mortar,” Juergensen said. St. Joseph is certainly not the first hospital to employ lean techniques. In the last decade, businesses have popped up worldwide offering job placements in hospitals and other fields for former Toyota employees and students of the lean philosophy. Jason Stiles, president and chief operating officer of Stiles Associates LLC in New Hampshire, a lean-focused search firm founded in 1991, said his company started getting calls for placing lean experts in hospitals in 2006. Stiles said the use of lean systems in hospitals is growing rapidly, a likely result of more transparency in hospital data. St. Joseph plans to implement lean processes in operating rooms next. While the process will save the hospital money, Norton said that is not the priority. According to Press Ganey, a leading national provider of patient satisfaction data, the average stay in Maryland’s emergency departments was 4 hours and 23 minutes in 2008, from the time patients walk in the door until the time they leave. The national average was 4 hours, 3 minutes. Hip! Hip! Hooray for Iowa! DES MOINES, IOWA – (July 1, 2009) The Iowa Business Council (IBC), during its 23rd Annual Partnership Meeting held in Des Moines on January 26, 2009, formally recognized the 100th Lean Enterprise event conducted within State government. Teresa Hay McMahon, Administrator of the Performance Results Division of the Iowa Department of Management and Chair of the Lean Government Collaborative, received a formal acknowledgement from IBC for this accomplishment. Recently I spent a day as a lean anthropologist, sitting in the back of the room and observing the behavior of senior managers during the monthly leadership team meeting of a large corporation. I hadn't done this in some years and it caused me to reflect again on how organizations do strange things, particularly in difficult times. The first agenda item of this meeting was to review how the team was progressing on its lean journey, but I quickly noticed a lack of actionable detail in the team's mandate. They wanted to create a "world class" lean enterprise, responsive to customers and all other stakeholders. That's fine, of course (whatever "world class" means -- I always ask and rarely receive a useful answer.) But how? What were the big, cross-organization problems standing in the way? What countermeasures were being pursued to clear the problems in the path? And who was taking responsibility to do what when to implement the best countermeasures? Given the lack of clear objectives and the lack of progress toward stating them, I was not surprised to feel the relief in the room when the meeting moved on from the high-level overview of "lean" challenges for the whole enterprise to the next agenda item, a discussion of each department's performance on its annual plan. Given that the plan had been developed in the second quarter of 2008 for a fiscal year beginning July 1, 2008, it was not surprising that there were a lot of variances from the plan to explain. But was the original plan wrong? Or had the economy collapsed in the mean time? (It had, of course.) Or was the plan poorly executed? Or was it all three? Or was it two of the three? Or…? In fact no evidence was presented and no analysis was done. Instead the discussion was about tactical measures to make the situation look as positive as possible by the rapidly-approaching end of the fiscal year. And the path of least resistance was short-term cost cutting including more lay-offs. I was disappointed with the turn of the discussion, but I did learn something. I could see more clearly than I ever had the phenomenon present in every recession as companies rushing to avoid variances in out-of-date plans continue to cut costs and jobs after economies start to stabilize and stock prices start to rise (as is happening across the world right now.) This instinct then shortly turns to a realization that the skeleton crew doesn't have the capacity to deal with revenue growth in a rebounding market. And this is followed by a burst of re-hiring or outsourcing. The intensity of this natural but unfortunate response by senior managers to cut costs – which economist John Maynard Keynes long ago called the "paradox of thrift" – is a key determinant of the length and depth of a recession. That' a shame for all of society because the recession is longer and deeper than it needs to be. But the loss to the company in this meeting was that the urgent – variances – had once again crowded out the important – the organization's long-term need to find its North Star and steer a steady course toward sustainable, superior performance. In fact, setting a course to stabilize the organization is what senior managers are supposed to do. And this is what senior leadership meetings should be for. "Are we all clear on what is really important for our organization in order to solve customer problems and succeed in the long term? (Or, stated another way, can we get past the merely urgent.)" "Are we agreed on what big problems we need to solve as a team?" "Are we sure what obstacles are in our way and their root causes?" "Have we – or will we now – assign responsibility for determining the best countermeasures and removing the obstacles?" "Critically important, do we have a way of surfacing and resolving all of the cross-function, cross-department conflicts that stand in the way of resolving all major problems in any multi-functional organization including ours?" If you can answer these simple questions -- blowing away the clouds that obscure your North Star -- you’ll be on your way to sustainable success as the world economy recovers in the coming years. And you may avoid disruptive shifts in course to deal with short-term variances in financial performance. Sakichi Toyoda (豊田 佐吉 Toyoda Sakichi, February 14, 1867 – October 30, 1930) was a Japanese inventor and industrialist. He was born in Kosai, Shizuoka. The son of a poor carpenter, Toyoda is referred to as the "King of Japanese Inventors". He is often referred to as the father of the Japanese industrial revolution. He is also the founder of Toyota Industries Co., Ltd. He invented numerous weaving devices. His most famous invention was the automatic power loom in which he implemented the principle of Jidoka (autonomous automation). The principle of Jidoka, which means that the machine stops itself when a problem occurs, became later a part of the Toyota Production System. Toyoda developed the concept of 5 Whys: When a problem occurs, ask 'why' five times to try to find the source of the problem, then put into place something to prevent the problem from recurring. This concept is used today as part of applying lean methodologies to solve problems, improve quality, and reduce costs. Sakichi had a deap respect for people, which is one of the pillars of Toyota today. What is a lean workplace? •Question: If motion is moving without working, then what is work? •Waste is identified and dealt with before it accumulates. Materials and information flow through the workplace at an accelerated pace; changeovers happen quickly and often; and people are flexible in their skills and are spirited in their involvement. There is a rhythm to work. Our appreciation goes out to Terry Grey, Deputy Director of Rhode Island Environmental Managment who has become a lean advocate. Terry just came back from Iowa where 140 people attended a lean government conference. The opening sentence of Terry's summary tells it all. Absolutely a fantastic event. Focused not so much on “what is lean” but how to get something going and sustained in an organization. Please feel free to circulate to anyone you have been working with on lean, particularly in lean government. As I say in the end, we’ll be refining our approach based on all the information and suggestions from this. If you want to discuss anything or get any further info, let me know. Once again, thanks for all the help so far. Clearly more to come. 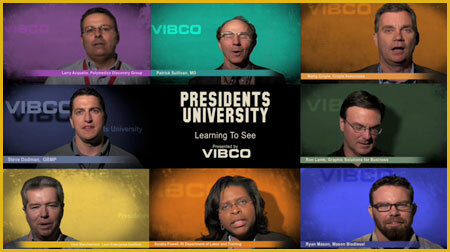 Here's a photo gallery from our VIBCO President's University event yesterday (6/15/09). We had more than 45 LEAN thinkers in attendance from government, business, medicine, non-profit... The LEAN movement is gaining momentum!